The chapters in Thinking With Data are based on presentations given at the 33rd Carnegie Symposium on Cognition. The Symposium was motivated by the confluence of three emerging trends: (1) the increasing need for people to think effectively with data at work, at school, and in everyday life, (2) the expanding technologies available to support people as they think with data, and (3) the growing scientific interest in understanding how people think with data. What is thinking with data? It is the set of cognitive processes used to identify, integrate, and communicate the information present in complex numerical, categorical, and graphical data. This book offers a multidisciplinary presentation of recent research on the topic. Contributors represent a variety of disciplines: cognitive and developmental psychology; math, science, and statistics education; and decision science. The methods applied in various chapters similarly reflect a scientific diversity, including qualitative and quantitative analysis, experimentation and classroom observation, computational modeling, and neuroimaging. Throughout the book, research results are presented in a way that connects with both learning theory and instructional application. 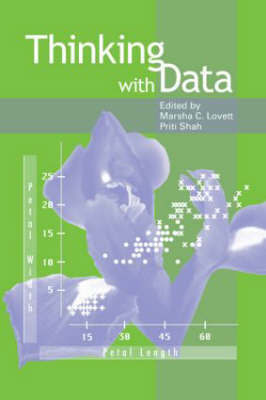 Part I focuses on the concepts of uncertainty and variation and on how people understand these ideas in a variety of contexts.Part II focuses on how people work with data to understand its structure and draw conclusions from data either in terms of formal statistical analyses or informal assessments of evidence.Part III focuses on how people learn from data and how they use data to make decisions in daily and professional life.